Also, I still have questions, like about why my whites go grey over time? (Is it the hard water? ); how to reverse the grey (is “dingy” grey? 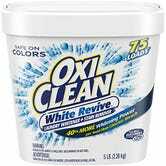 ); is Vanish Oxiclean? ; how does the Cascade thing work and what is Cascade in the U.K.? ; are very old bloodstains cause for buying new sheets, or will the peroxide thing still work? ; why do people tell me to boil my whites sometimes, and should I do it? I have many questions. Sorry … not sorry? Never apologize for having many questions! Questions are good! Life would be boring without an inquisitive mind, and also I would be out of a job if it weren’t for enthusiastic question-askers, so you know, ask away! Spring is just starting to spring, and so this is a good time to put together a basic primer on keeping white clothing and items like white sheets and towels looking bright white. Bluing: I’m starting with bluing because I love bluing beyond all reason! It does exactly what the name suggests it does: It turns things blue. Which, in the case of whites that have gone a bit yellow, is exactly what you want. The blue cast will counteract the yellowing, giving the overall appearance of bright white. 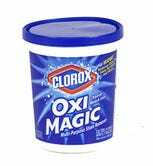 Oxygen Bleach: Oxygen bleaches like OxiClean and Clorox Oxi Magic can be used in two ways to keep whites white. The first is in the wash alongside your regular detergent, which will help to keep whites looking their best. However, over time — even when following the best laundry practices — most whites will become stained, or just dingy-looking. When that happens, dissolve a scoop of oxygen bleach in hot water and soak whites for an hour up to overnight (the longer the better!) before laundering as usual. Hydrogen Peroxide: LW asked about using hydrogen peroxide for treating old blood stains, which yup, sure! To use HP to remove older, more set-in stains, dilute a half-to-full cup of it in water enough to fully submerge the stained item(s). For spot treating fresher/smaller spots, dab a small amount onto the stain prior to laundering. It’s worth mentioning that HP can cause color loss, so if you want to use it to remove stains from fabrics that aren’t white, spot test on an inconspicuous area to be sure it won’t lead to damage. 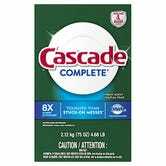 Cascade: Using Cascade dishwasher detergent — the powdered stuff, please! — to clean whites is something I learned from caterers, actually. It works as a pre-soaking agent for whites because it has a bit of bleaching effect; for this reason I don’t recommend you use it on anything other than whites to avoid the risk of damage. For badly stained or soiled whites, dissolve a cup or so of Cascade in very hot water and then soak them in it for several hours up to overnight, then launder. 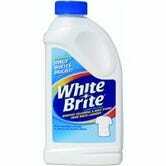 White Brite: White Brite is is a laundry booster that’s used in addition to regular detergent. It’s especially helpful to know about it if you end up with whites that have been stained by sunscreen — which shouldn’t be treated with either chlorine or oxygen bleach. 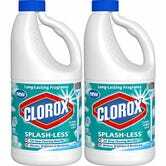 A Note on Chlorine Bleach: Generally speaking, for several reasons, I don’t recommend chlorine bleach for use in laundry. It has a chemical reaction to a lot of things that commonly stain whites (sweat, sunscreen) AND it’s pretty harsh on textiles, so skip it unless you’re absolutely, positively devoted to the idea of using it. “Dinge” is an actual industry term! It refers to that sort of gray, dingy (yup!) cast that white clothes, sheets, towels, etc. tend to develop over time. Usually, this is a result of product buildup from overusing detergent, boosters, fabric softeners, etc., but it can also happen because of hard water, as LW guessed. To reverse it, try the long soak method using oxygen bleach or Cascade. There’s an entire column to be written about the nuances of water temperature, but briefly: Hotter water will more effectively remove soil and brighten whites. However, it also causes more damage to textiles than cold water does, so it’s best to only use hot water for laundering when you absolutely must. This is a thing that comes up from time to time, and I have help for my non-U.S. audience! It’s not foolproof, but generally speaking if you plug an American product name that I’ve mentioned in my work into your country’s Amazon search bar, it will spit out results for equivalent or similar products in your market. And yup Vanish is, indeed, the U.K. counterpart to our beloved OxiClean!